Vin Ganapathy, a teacher in Sketchbook Skool 6, demonstrated portrait drawing and then assigned us homework using his technique. He likes to do a quick drawing live, then take lots of photos, and use them to finish the drawing later. 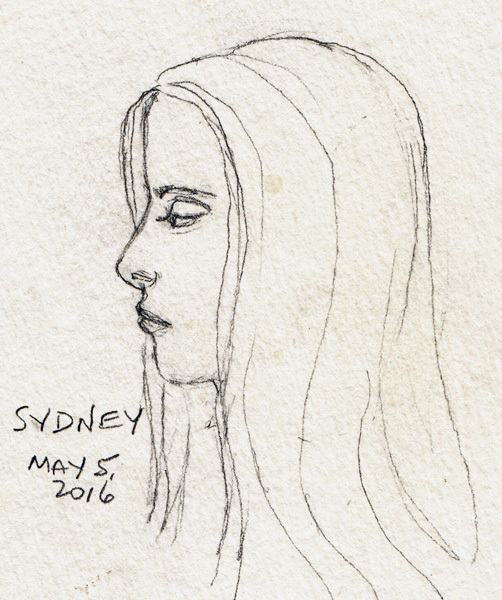 He did two people sitting on a couch, but my first opportunity to draw and take photos was when I was sitting next to a grandchild - in profile. I find it very difficult to capture a likeness of family members, and these 3 are a little better than usual. 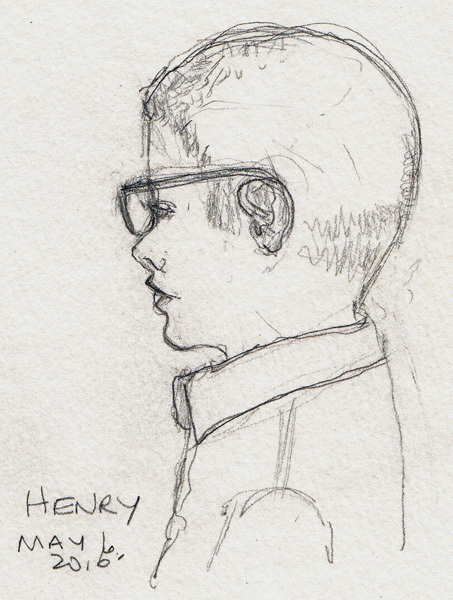 Henry was sitting next to me at a concert at the Metropolitan Museum of Art. Sydney was presenting a project to us at school. 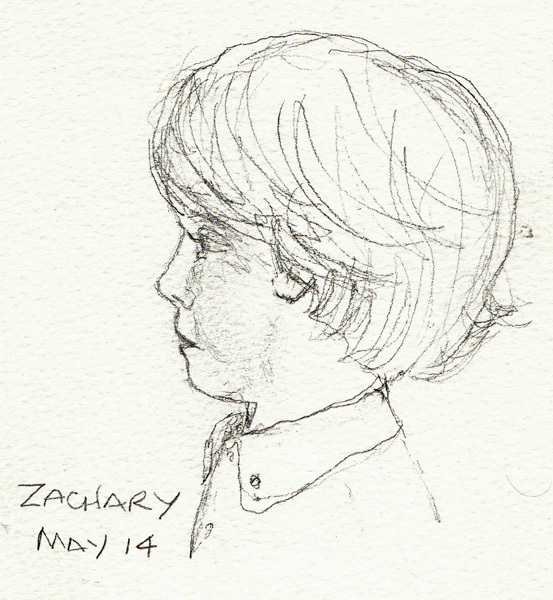 And Zachary was sitting next to me at a Young People's concert at Lincoln Center. The drawings were done with pencil on watercolor postcards that I carried with me. The technique was helpful, and the photos helped me better draw nose shapes and lips. 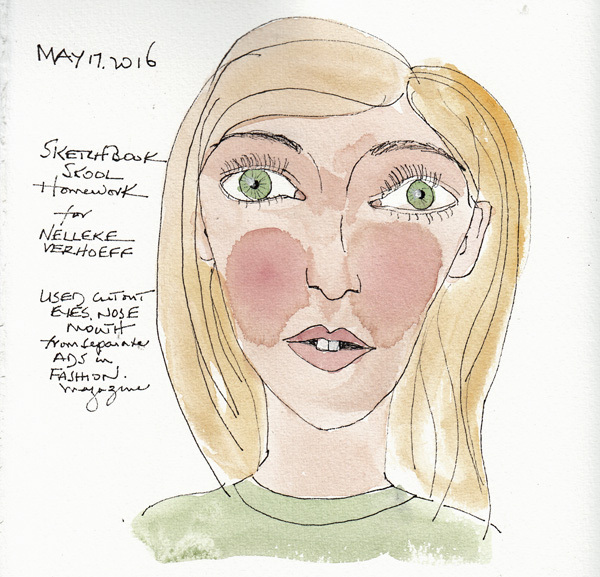 The very next week in Sketchbook Skool, Dutch artist Nelleke Verhoef imtroduced "Faces" from photo inspirations. She maintains envelopes containing eyes, noses, mouths, and hair clipped from magazines - and mixes and matches them to inspire random face drawings. One of her special additions is red cheeks - which is also the name of her illustration studio. I got a Vogue magazine from my daughter, clipped apart face components, and made my own reference envelopes for the project. I quickly sketched this face in ink and painted it with watercolor, and may use this technique for my imaginary drawing project. 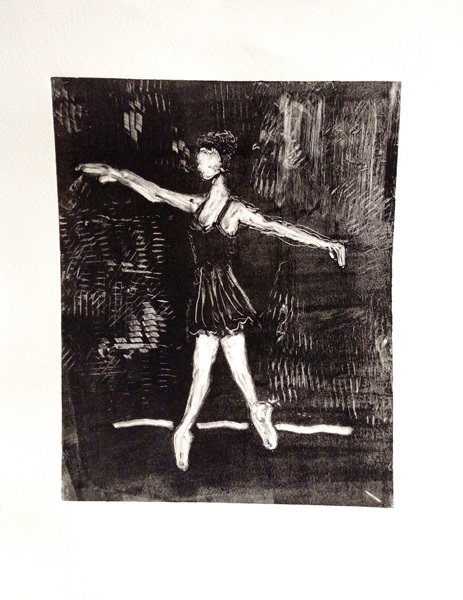 I went to my second Monotype session this week at MoMA and made 3 prints - but only uploaded two here - another ballerina and another Axel print. 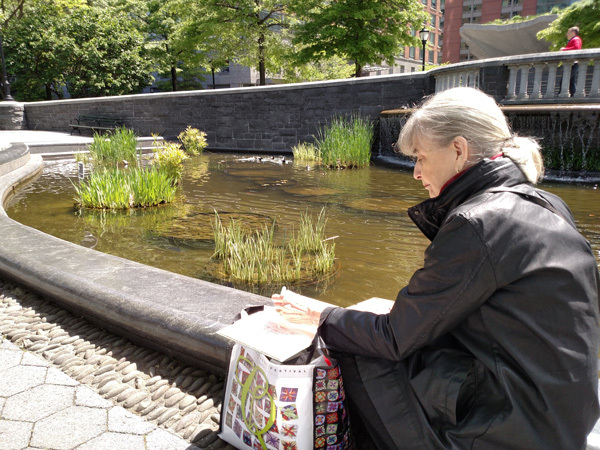 Weekday NYC Urban Sketchers met in Rockefeller Park in Battery Park City this week, and I was completely mesmerized by ducks. 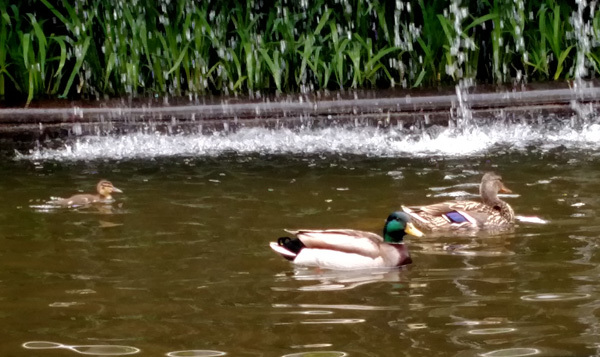 When I arrived I watched a male swimming all over the pond behind a female and a total of 7 ducklings that were scattered and having fun. 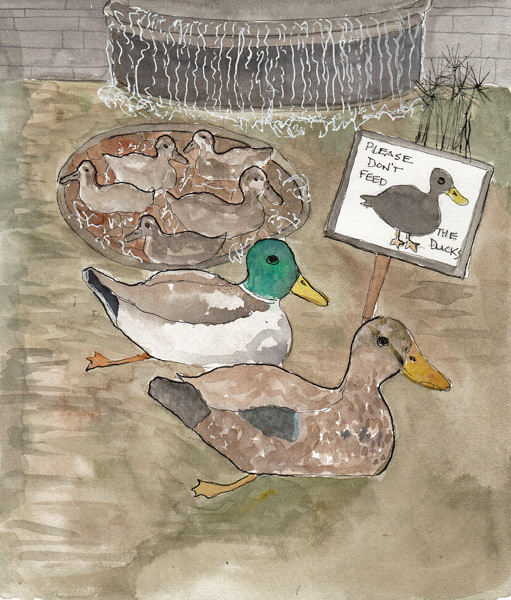 I sketched them quickly and spent the next hour watching them to determine their coloration. I can't describe how much pleasure I got from sitting in the sun, watching and photographing them. Midway through the hour 3 gangster males arrived and fights began. 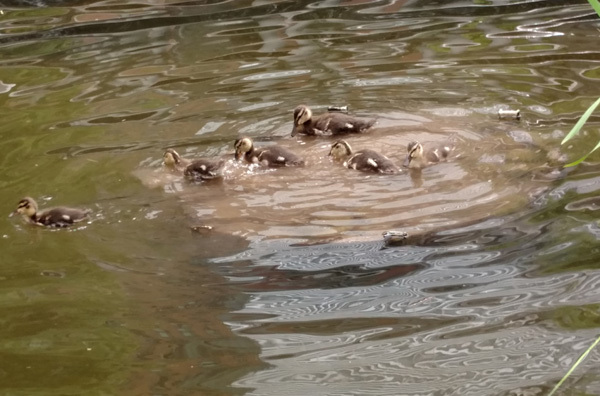 But the original male kept them away from his family. It was very noisy! 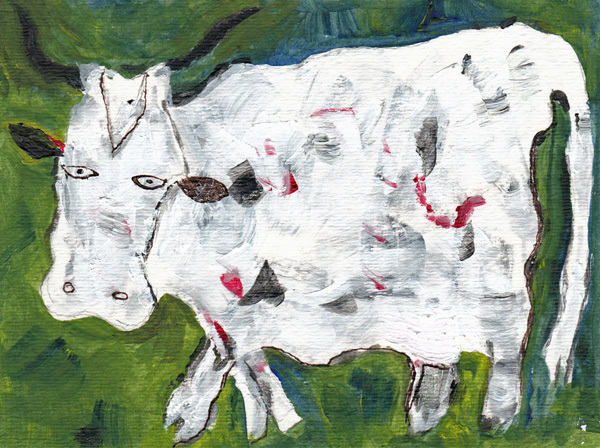 I quickly sketched one of Dubuffet's four large LaVache paintings when at his exhibit at Acquavella Gallery on the Upper Eastside. My goal was to paint it with my acrylic paints before putting them away after my abstract painting class ended. 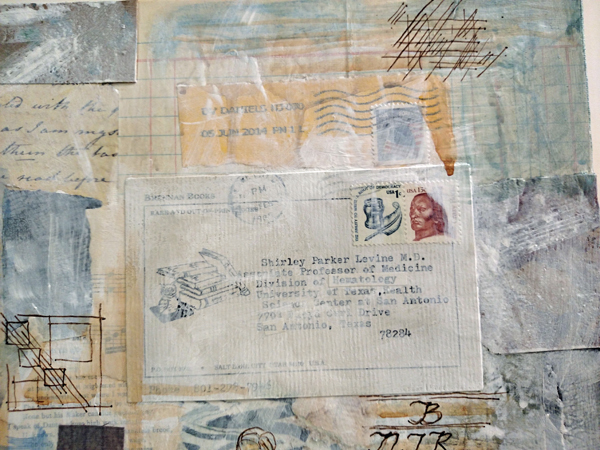 The painting is on a watercolor postcard. 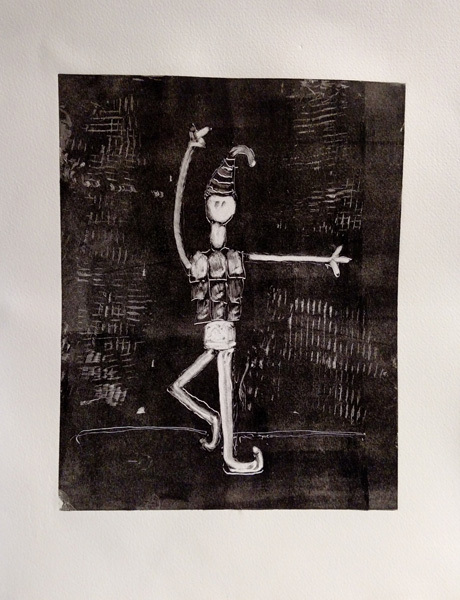 Monotypes, Pen Drawing with Watercolor Wash, and an Acrylic Painting - I think I need to focus! My 3rd and last painting of my FIT Abstract Painting class is finished. 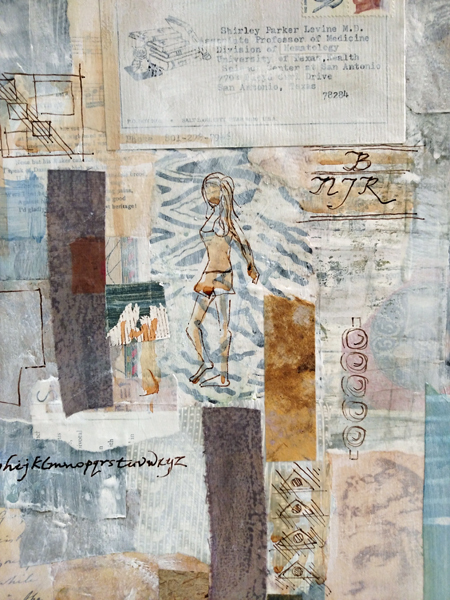 For this painting we were instructed to use different materials and/or processes in the painting, and I chose collage, paint, and ink. 1. 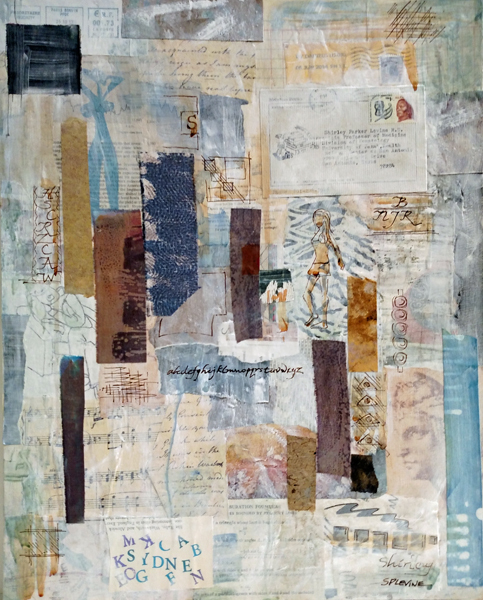 I covered the canvas panel with torn scraps of papers that I've been saving or making, and mounted the paper with matte medium. 2. 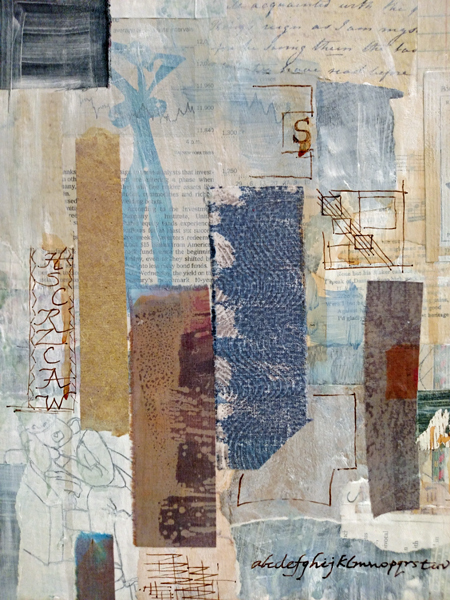 I painted over the collage with acrylic paints, taking care not to cover up the images completely. 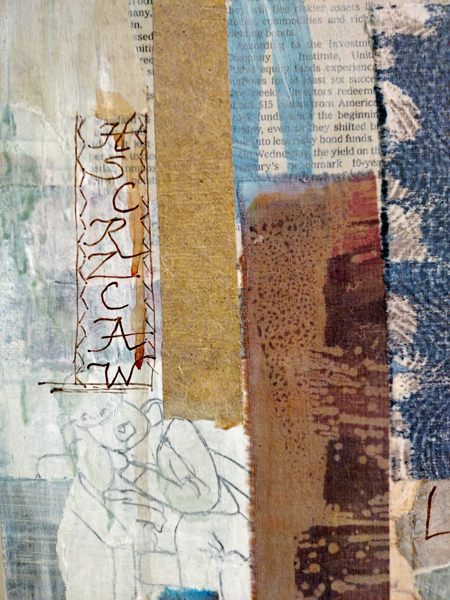 In the next layer I added more collage - of either paper I painted or fabric strips I dyed. 3. At the end of our last class our professor told me she thought that I could push it further. So I used Daler-Rowney F and W acrylic brown ink for calligraphy, drawing, and mark making for the final layer, Adding ink was an inspiration from the Hannalore Baron exhibit I saw several weeks ago. 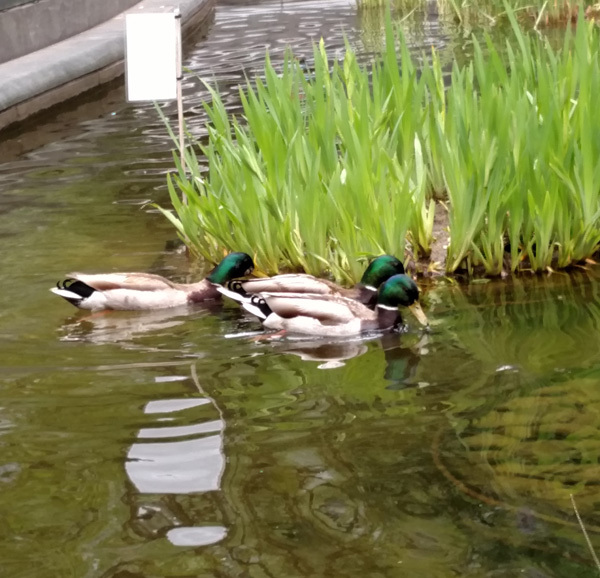 After a morning gallery-hopping at exhibits of Dubuffet, Hannalore Baron, and Will Barnett, Benedicte, Pat, and I arrived at Battery Park City for Figure Drawing just as the rain started. Instead we went to the Smithsonian National Museum of the American Indian, New York branch, to see their newest exhibit. 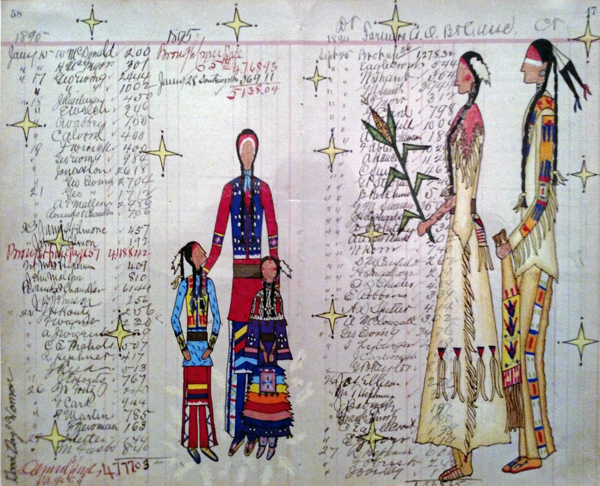 The exhibit, which will not close until December, is called Unbound: Narrative Art of the Plains. The Museum is in the historical Custom House near Wall Street. 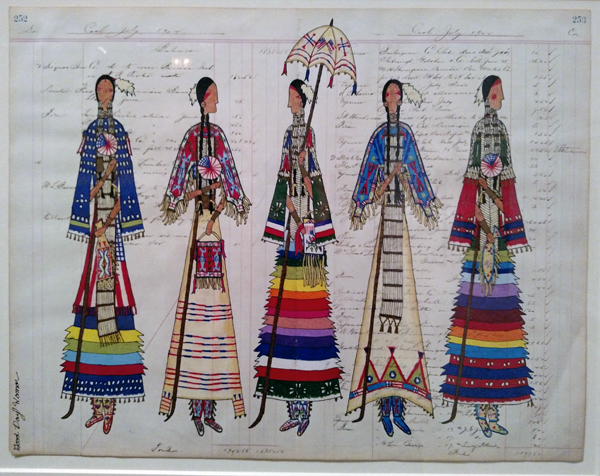 Several years ago I learned about Indian narrative art at an exhibit at the Met and I was fascinated by the drawings they did of their life and culture in Ledger Books. This exhibit also shows narrative art on vintage ledger pages, but most of these Indian artists are contemporaries. Where noted, color was added with colored pencils. 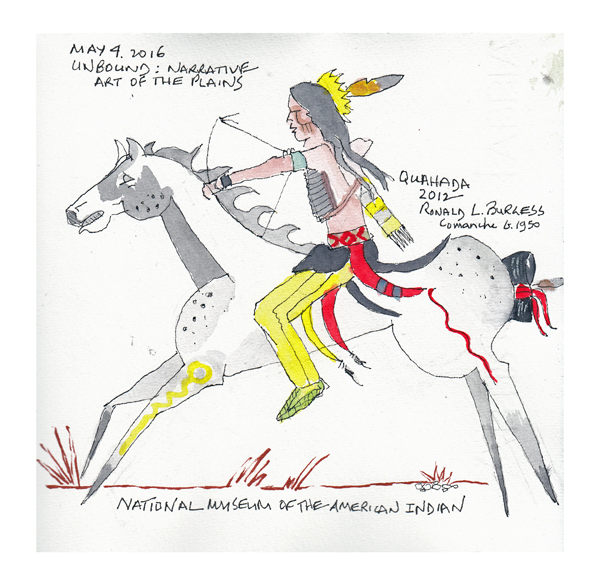 This is my copy of a drawing done by Comanche Artist Ronald L. Burgess in 2012. 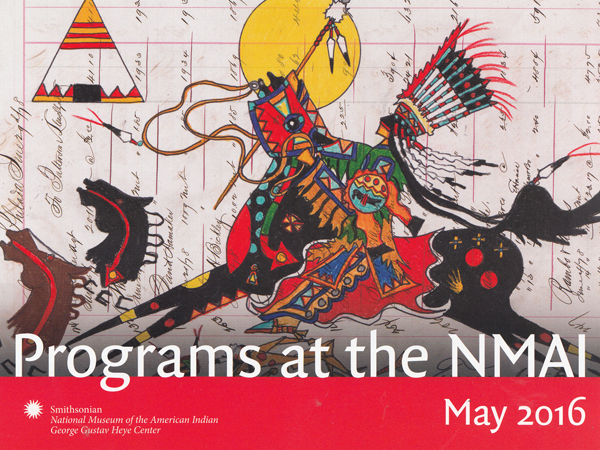 This is the postcard for May family events at the Museum and it shows the gorgeous ledger paper used for the drawing. The artist is not named on the card. Some of my favorite drawings were done by a woman artist, and they were scenes of domesticity, instead of hunting and battles. Lauren Good Day Giago (b. 1987) descended from the 19th C. ledger artist Bloody Knife and was taught beading and sewing as a child. I loved the bright colors and subjects she chose. One of my high school girlfriends sent me a latter with a photograph and a 5 X 5" X 1 5/8"DaVinci Wood Panel. 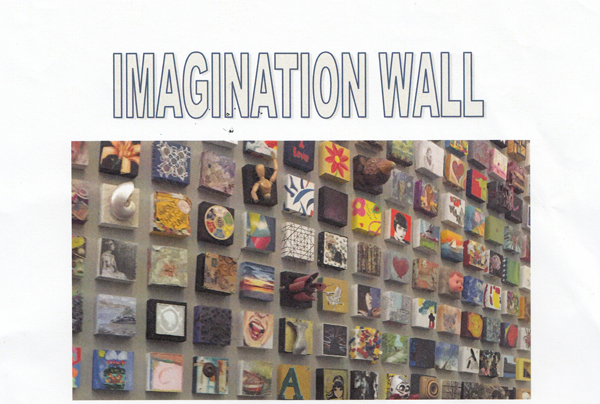 She photographed the wall in her local library and wanted to have her family and friends each create one of the panels for her entry in a new home. We could decorate them in any way and had 6 months before we needed to send them back. That gave me too many choices and too much time! My creative ideas are always better when I have limitations. 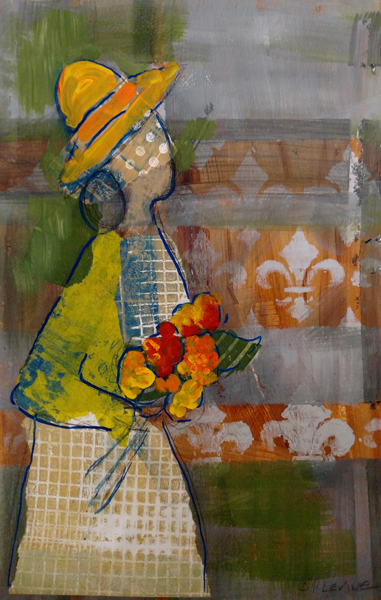 I had never painted on wood, and prior to this semester had minimal experience painting with acrylic paints. And I couldn't even settle on one image for weeks. 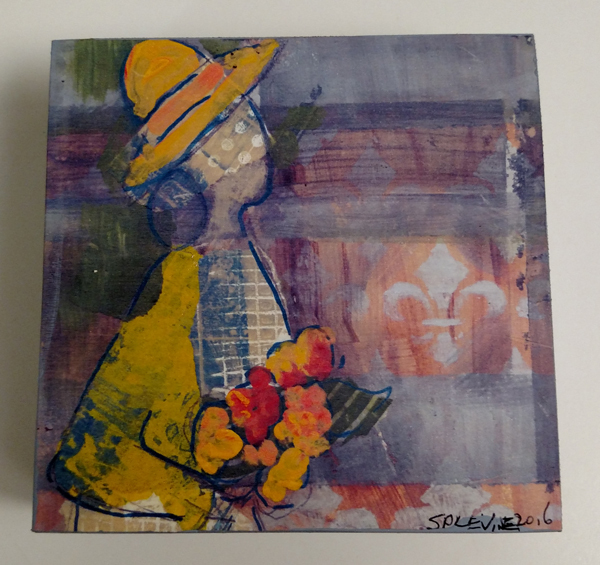 One day I noticed my one acrylic painting on a shelf in my apartment, and realized that the image was perfect - a friend bringing a friend a bouquet of flowers. 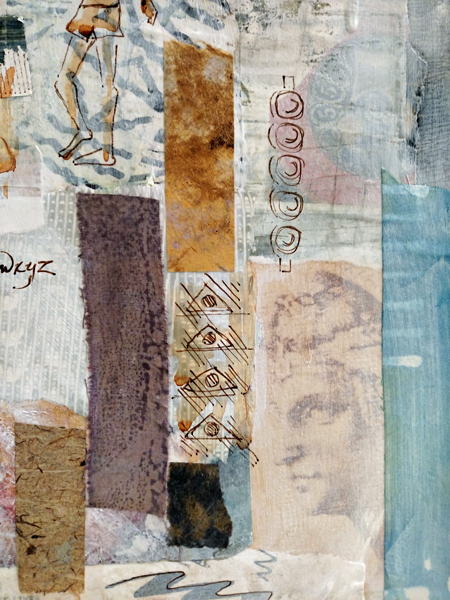 In that instant I decided to scan, resize, and collage the image to the box. 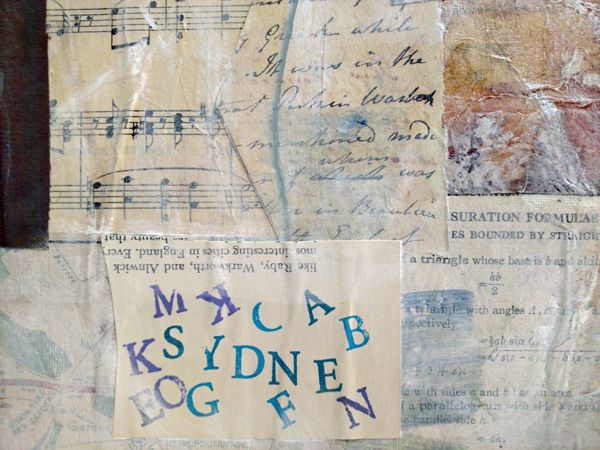 Jane Davies recently posted a tutorial on collaging art to wood, and I followed her instructions. Then I painted the sides with acrylic paint I mixed to blend with image. 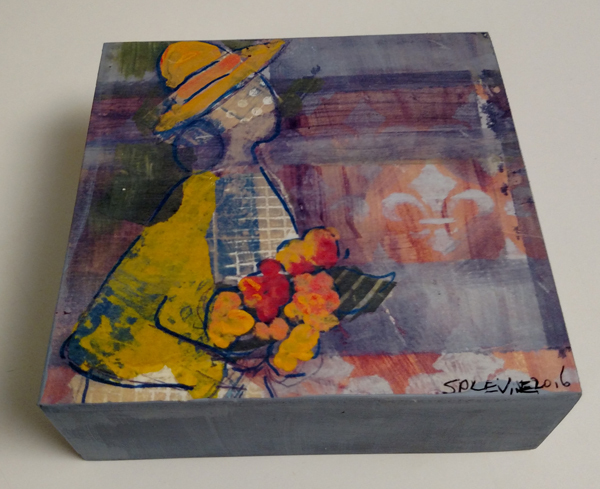 Here is the original painting and the finished box. It is being delivered today - per USPS tracking information.